MegaSpin pokies allow us to play several spins at once, much like multi-hand video poker or multi-hand blackjack. Some versions let us choose how many separate games we wish to play, while others come with a fixed amount – but either way, we get more chances to win than with a conventional Web pokie. Let us show you a few of our favourite MegaSpin slots, as well as how and where Australians can play them for real money on the Internet. Royal Vegas Casino is our number one site for real money MegaSpin pokies in Australia, with more than 400 interactive slot games all up and a generous AUD $1,200 sign-up bonus on offer. We also rate All Slots Casino very highly, with its special focus on Internet poker machines for Aussie punters. Platinum Play carries an excellent range of AUD MegaSpin games along with hundreds of other computer slots, which are available for instant-play directly over your web browser. Each one of these recommended Web casinos comes with the eCOGRA Seal of Approval, ensuring stringent online banking security and fair, honest gaming. www.RoyalVegasCasino.com – Get up to AUD $1,200 free over three deposits. www.AllSlotsCasino.com – Claim as much as AUD $1600 in bonus credits. www.PlatinumPlayCasino.com – Sign up and receive up to 1,500 free bets. To start playing MegaSpin pokies online, log in to your casino account or register at one of our recommended AUD slot sites. If you are using the desktop client, you should be able to search for available MegaSpin games; if playing through the Web browser via Flash, scroll through the pokies selection until you find a game with ‘MegaSpin’ in the title. Depending on the specific slot, once you launch it you may be able to choose how many separate games you wish to play (usually between four and nine). 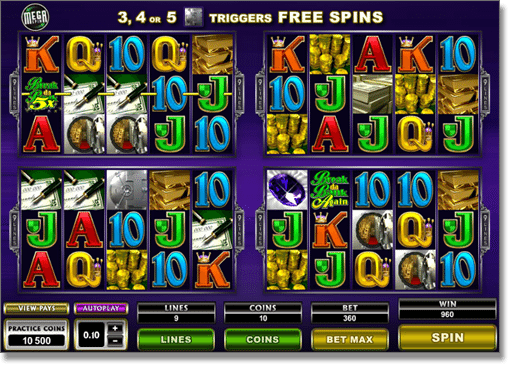 Other MegaSpin pokie machines come with a set number of games for each turn – for instance, MegaSpin Break da Bank Again (pictured below) always features four games per spin. From there, it is just like playing any online slot. Select the coin amount (e.g. 0.01, 0.02, et cetera), the number of coins you wish to bet, and (if offered) the number of pay-lines you want to cover, and away you go. No matter how many games are played simultaneously in a MegaSpin pokie, each one follows the same rules, betting requirements, and payout schemes. For more info on how to play Internet pokies, see our dedicated article here. MegaSpin Web slots are developed by Microgaming, a highly trusted brand renowned for its stellar casino software and outstanding virtual pokie releases. Here are our top picks for AUD multi-game poker machines on the Net. The Break da Bank series of digital slots is among the most popular on the planet. This MegaSpin version is based on the sequel, with five reels, nine pay-lines, and four separate games per turn. Covering all win-lines across all four games costs a minimum 36 coins per turn, but the potential rewards are enormous – for instance, one spin can get us up to 100 free spins with a 5x multiplier to boot. Click here to try out MegaSpin Break da Bank Again at Royal Vegas. The MegaSpin treatment transforms this three reel, single pay-line slot into a veritable gold mine with options all over the place. We can play four, six, or nine games at once, with a maximum bet of three coins per game. Wild multipliers up to 25x make for massive rewards, and the 15,000-coin jackpot per game means a single spin could potentially return a top prize of 135,000 coins. Click here to play MegaSpin High Five at www.RoyalVegasCasino.com. One of Microgaming’s best-loved progressives also comes in a multi-hand format with more chances than ever to strike the motherlode. Based on the classic three-reel version of Major Millions, this MegaSpin jackpot pokie gives us six games per spin with up to 18 pay-lines in play. Betting the maximum 18 coins per spin (i.e. three coins per game) puts us in the running for the coveted Major Millions progressive jackpot, which starts at AUD $250,000 and has been known to soar into the rarified air of seven-figure payouts. Click here to check out MegaSpin Major Millions at Royal Vegas Casino today.